This is cool! 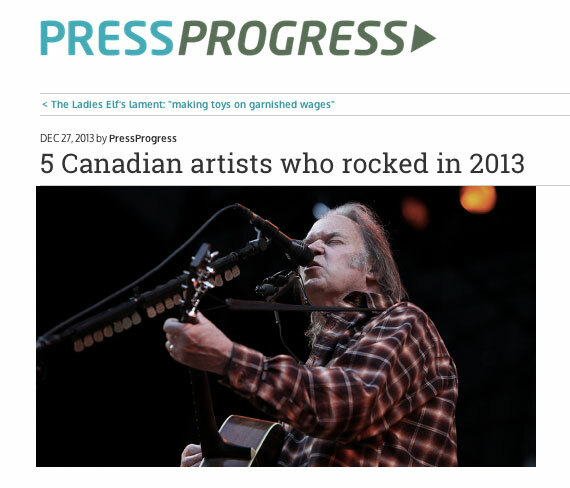 Social and environmental activism is at the heart of the “5 Canadian artists who rocked in 2013” named by Press Progress. I am thrilled to be one of the five artists. Neil Young for his “Honor the Treaties” concerts benefitting the Athabasca Chipewayan First Nation in Northern Alberta. London-Ontario born Rapper Shad’s song “Fam Jam” about the immigrant experience in Canada. Godspeed You! Black Emperor who won the Polaris Music Prize for Album of the Year — and then donated their winnings to prisoners in Quebec for musical instruments. Sarah Harmer for headlining the “Rock the Line” concert to protest the plan from Calgary-based energy distributor Enbridge to modify its use of an oil pipeline running between Ontario and Quebec.